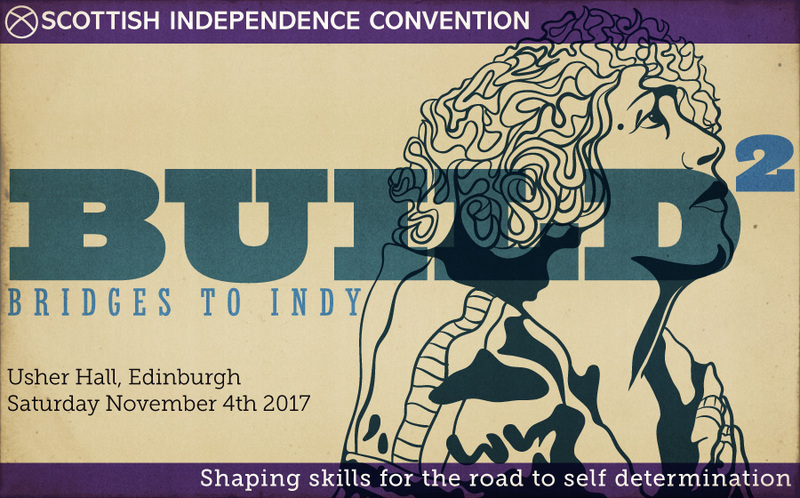 The Scottish Independence Convention has announced a major conference in Usher Hall in Edinburgh on Saturday 4th November, called Build: Bridges to Indy. It promises to be a huge convergence of the independence movement around practical issues and capacity-building, forging unity and communication and building strategy for the future. Speakers from across the independence movement will explore the research, discuss answers to the big questions and the consider how to organise as the movement advances into the next year. Following on from January’s sold out conference in Glasgow, this conference aims to build on the work that is being done all across Scotland to outline practical steps that we can take to build bridges between ourselves and those who are not yet supporters of Independence. The previous national conference of the Independence Convention in Glasgow attracted the attendance of nearly 1000 people and this new venue in Scotland’s Capital will allow for double the capacity. The full programme will be released in the coming weeks and the conference is also expected to play host to entertainment throughout the day. Event passes are now on sale on the Usher Hall website for £15 with concession prices of £8. Book your place – share this link – build our movement. Tickets are available here. Hopefully all strands now coming together in force once more to form a battle plan for Independence when Brexit is complete . You can hold all the conventions you wish, wave as many flags as you can, but until the currency and economic questions are answered, you are going nowhere. Let’s be honest, it doesn’t make the slightest bit of difference which currency or economic plan we come up with, Unionists will find some way of saying, ‘That won’t work.’ As far as the Brits are concerned, it’s about identity. Their economic argument is a smokescreen. All the more reason to get a sound footing for the questions. Hardline Unionists are not the target, and they will be picking at any suggested way forward. The target audience is waverers and soft yes and no voters. Part of the reason for the loss on the referendum was there were no thought through, realistic answers to those questions of economic activity and currency, nor to the pensions issues, nor even on basic stuff about the border and freedom of movement. The ecomony matters a lot. That the situation has changed a good deal is certain, but it does need a deal of respectable effort to be remotely credible. Serious research and credibility from some solid experts might. Wishful thinking and back of the envelope sums are not going to cut it with waverers. In fact there is a whole list of issues to which answers are needed. If you want to look credible on the door step it needs being able to say that the issue has been given attention. NOT that this will be the case necessarily but that these are realistic workable alternatives. First off, I am assuredly not “demanding that ‘hard information and tools to make things happen’ are delivered from on high.” Please do not put words in my mouth. I am however convinced that real answers are available to real questions. Where they come from is a matter of who can do it. It is worth funding some of that research. Sorry but from outside the central belt it does look very like a metropolitan eleite doing their thing and never mind the rest. I have seem pretty naked power grabbing from groups who fancy that their way is the way. As I have seen it just means people withdraw. It is deeply demotivating and any criticism is silenced. As for others organising events, yes they can, but it is not helpful when things like SIC get attention from the likes of the National and the First Minister who will not take note of an event in the sticks. As I said we seem to have a select few people forming an Independence Establishment. Unless you give a voice to the voiceless Indy is really going nowhere. Wishful thinking is not going to cut it. Hi Chris – the SIC is made up of groups representing dozens of grassroots indy groups from round the country. They are organising a huge national conference to bring everyone together and to create a unifying strategy. Your complaint seems to be that the National – our only pro indy daily newspaper is covering this. Can you see how odd this seems? I can assure you that many many people have worked for free to create and sustain the SIC and to describe themselves as an ‘Indy Establishment’ is pretty insulting. The event looks to be very positive and I’d urge everyone to look at the programme and come along and contribute. Sorry, Chris, but all I see here is someone from our own side trying to pick apart people who in good faith and for the cause are just trying to make things happen. In any movement we need folks who are going to take the initiative, keep people motivated and get things done, and I can’t see how you think it is helpful to do the opposition’s work for them by undermining it. The ‘hard information and tools’ you’re requesting don’t just come out of nowhere, they come from conferences like this. As I say, you’re at liberty to organise one of your own in your own part of the country, and I’d like to think the rest of us would support it however we could, instead of de-legitimising it. The Tory’s told us all about their wonderful plans for leaving the EU and the effect it would have on jobs and services didn’t they , NOT ! Culture in all its facets is the key to independence and is arguably why so many Scots are still looking for independence today, over 300 years after the ‘union’ charade was first signed off in a ‘slump’ of subterfuge and bribery among unelected elites. Issues such as “…the currency and economic questions..” are actually far, far and far less important than culture. The way people vote primarily reflects their dominant culture (however influenced and ingrained). If you feel British more than anything else, then you will obviously be more inclined to vote to block/prevent Scottish independence. On the other hand if you consider yourself more Scottish, you will tend to vote for independence. Money/economics, or foreign policy, immigration, the EU etc are not the deciding factors by a long way. I hope the conference considers the importance of cultural factors. For anyone unsure of this, I suggest they read Alan Bissett’s great poem entitled ‘Vote Britain’, which I heard him recite on Calton Hill prior to indyref I. Maybe this conference could begin with that poem! Cultur is wha we are, hou we think, whit we dae (e.g. how we vote), an how we dae it. Looks like yet another gathering of the great and the good, and excluding those without much disposable income. I fear it is yet another gathering of the Indy establishment. It needs some really radical thinking,and so many times it is just not happening. If we were serious things like this might be happening outside the central belt. If you are on benefit it is prohibitive to travel, and a lot of talent and willingness is thereby excluded. In any event people do not need telling what to do or organising, they need hard information and tools to make things happen. The centralising tendency is not helpful. I could go on but there is an inbuilt assumption that seems to run deep that people have disposable income and if they are not then they do not matter. Or at the very least they are ignored. One simple example was the Indy App. If you do not have a good data plan it is impossible to use and/or expensive. The same information on-line as a website could at the very least be accessed via the free library internet. Central to making it really happen is sking how do you reach the young and marginalised in plces like Lochee or Maryhill, never mind Inverness or Abington. This is a strange response, which on one hand complains about a gathering of the ‘indy establishment’ but on the other is demanding that ‘hard information and tools to make things happen’ are delivered from on high. It’s not about ‘centralising’ it’s about just getting people into a room – whoever can make it – to share information and motivate. So much activity happens online it’s necessary to have real world events where people can meet up, talk, discuss and move forwards. I know what you’re saying about Central Belt-ism but fact is the bulk of Yes activists ARE in the Central Belt and there is nothing stopping anybody in any part of the country organising a conference themselves. We’re in a depressing place if Yessers are moaning about Yessers having events. Some comments seem to have have vanished? Page says says 4 and I can only see 3? Chris I sense you impatience and frustration at perceived lack of progress toward our aim. Please read again what Lesley Riddoch says at start of article. Surely you are in agreement with her very succinct expression of situation at present. This is the correct direction of travel and I applaud all involved.